Have I ever mentioned how much I love making sundaes? I mean, really really love. It's just fun. Picking the right base flavors or experimenting with somenew, going nutty with the whip cream, dreaming up the latest topping and then often dressing it up with a little sauce for good measure. (sorry, I don't keep cherries on hand). My daughter actually picked a sundae over the cookie dough pie when I asked what she wanted for snack, and that's fine by me because I need to do a little creating. Heck, I wouldn't be terribly opposed to working a second shift somewhere so that I could make treats more often... not that I have the energy for that, but nevermind that now. 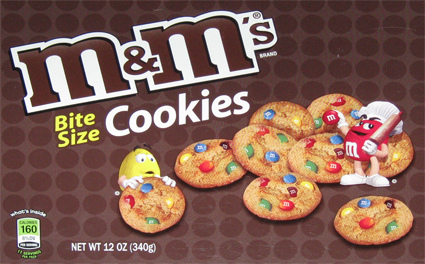 This is the big brown box of M&M cookies that has been calling my name ever since they built the new market basket in my area. I just kept putting off the purchase, but I finally gave in about two weeks ago. Whoa, they're itty bitty cookies! I try a few and they remind me a lot of those little crunch cookies you use to get at MickyD's. They are definitely a similar size and consistency. Now let's throw 3 of these in a ziplock bag and start crushing! See, now doesn't that look tasty? 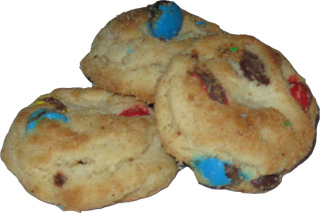 The crunch of these cookies is absolutely perfect as a sundae topping, plus you get mini M&M's scattered throughout now. 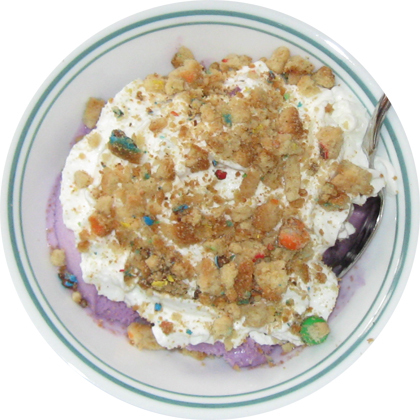 This isn't actually today's sundae but the one I made last weekend with Friendly's slow churned black raspberry underneath. So take it from crunch-lovin' someone who did this a thousand times as a child, smash a cookie on top of your next sundae and enjoy!